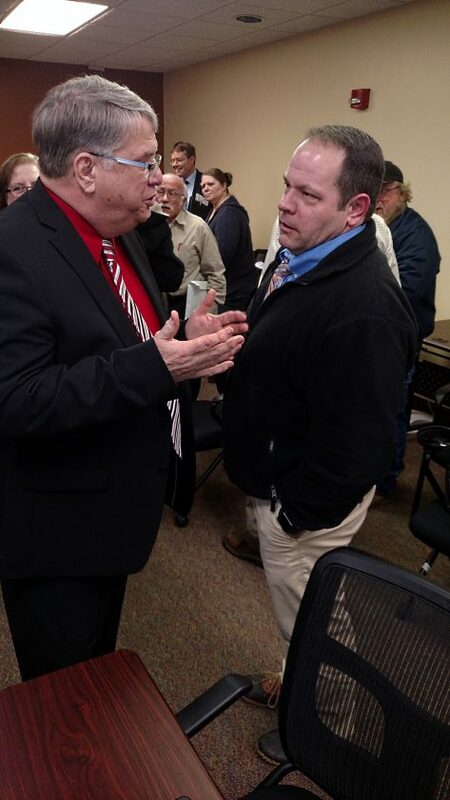 Paul Harrison (left), the new Seneca County treasurer, talks with outgoing treasurer Damon Alt after Thursday evening’s vote. Paul Harrison, of Jackson Township, is the new Seneca County treasurer. He was selected from a field of four candidates by the Republican Central Committee during a meeting Thursday evening. It took three rounds of voting before Harrison was chosen. The other three candidates who submitted applications were Chris English, David Koehl and Stephen Welter. Harrison said he wasn’t sure how the vote would go. “Chris (English) and I were pretty much neck and neck until that last vote,” he said. Harrison said he’ll be in the treasurer’s office becoming acquainted with his new job, but won’t actually become treasurer until paperwork is filed with the state and he is bonded. “It should take about a week,” he said. Until then, acting Treasurer Rebecca Hohman will remain the official treasurer. He found the clerks “very capable” during the current busy tax season. “Damon did a good job bringing the office into the 21st century,” Harrison said. He plans to spend time in the beginning learning how the office works now and before considering any changes. Harrison said he plans to run for his own term in 2021. Until then, he’ll be serving the remainder of Damon Alt’s term, who served as treasurer for nine years and left the elected position Jan. 31 to become magistrate in Seneca County Common Pleas Judge Michael Kelbley’s court. “I’ve always had politics in my blood I guess,” Harrison said. He was a farmer for 30 years, but no longer actively farms. He was a Jackson Township trustee for 17 years. He also served as director of Seneca Regional Planning Commission for 13 years, and as Seneca County Farm Bureau director for 12 years. During the planning stages of the vote, Vanessa Treft, chairwoman of the Republican Central Committee’s Vetting Committee, said appointing the treasurer was a duty assigned by the Ohio Revised Code. In preparation for the vote, Treft said the Republican Central Committee took resumes and applications. The four candidates then were sent questionnaires to provide committee members with information they needed to make a choice. Before the vote, each candidate spoke for 2 minutes and answered committee questions.